The smart technology of the developing nation obviously contributes to making its generation even smarter. Every other individual is seeking the best ways to identify the best medium for investment in stock market and when it is considered for mutual markets than the individual take reference from their friends or more than that from their hired professionals. Knowing the basics of mutual fund environment. Transacting the purchasing or funds, redeeming etc. Types of funds and their significance in the market. To achieve the above necessary details, one has to call his professional or consult his friend so that to make useful and successful decisions on his investment activity. Then calling, again and again, the same personality irritates and urges you to find something more useful way. Don’t worry! There is a way, a technological but a very easy way to find the solution to all your problems and that way is called the “Apps”. Apps are the applications based on a certain theme and as we are discussing on mutual funds here, so here you will get top mutual fund app only. They provide you with information regarding the different mutual funds available in the market. The fund performance over the years. The customer’s reviews and rating. Direct mutual fund app provides you ratings and ranks from famous and recommendable portals like the Crisil and the Value Research Online. Peer comparisons of the respective funds. How to invest guidelines for every fund. Redeem the funds & many more. Now, you must be pondering that Which is the best app for mutual fund in India? Let’s find out the top mutual funds app names which are providing you the above-mentioned qualities. 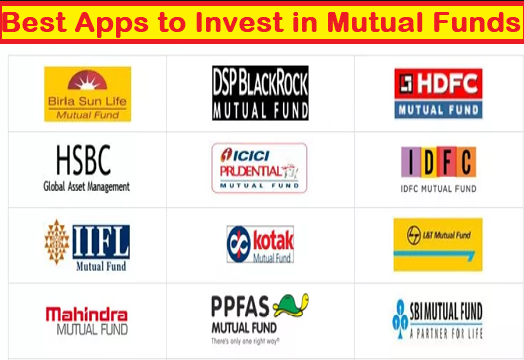 Just visit the links of these best apps to invest in mutual funds and from there you can download the mutual fund applications of your choice. Investors, you have now the list of best mutual funds Apps available with you. Let us know what are these APP has to offer? Let’s discuss each online mutual fund investment app that what these apps are offering to you? here, you can discover smarter ways to transact in Mutual Funds. It is a single channel to access the multiple MFs from 15 Mutual Fund houses., so no more managing multiple PINs, folio’s numbers, login IDs. You can link your Aadhaar with eKYC. It provides the distributors and the investors a medium to transact investing activities in a paperless medium. Switching between funds, purchasing new funds, redeeming amount, taking SIP plans, all can be done through this best mutual fund app. Helps you to manage your portfolio on your mobile screens. It is a mutual fund app by SBI Mutual Fund. It allows the investors to manage their portfolios smartly. It prides a nice user interaction so that they can grab the things quickly. It provides NAV updates on a daily basis. You can come to know about the SIP returns with its inbuilt SIP calculator. You can book SIPs, purchase funds and make redemptions via this best mutual fund investment app in a simple way. eKYC has been assisted by this app to link your Aadhaar with your funds. You can select the folio as per your needs from the available number of funds there. Customer-wise reports are available to the distributor. A calculator is there to calculate the returns on your investments. You can access your club pointy status, view and redeem benefits exclusive to your club class and get recent updates at a button click. You can access your folio information from this mutual fund online app. You can do activities on your folios like additional investments, redemption, switching, etc. You can upload your proof of date of birth. You can gain regular updates on NAV. You can also request for account statement. You can perform investing activities anytime and from anywhere. It provides updates on NAV and their history. Helps in goal planning in every stage of life. You can schedule appointments with its advisors. You can purchase funds, make and execute SIPs, redeem the funds, create a wonderful portfolio in one go on some clicks. You can access your portfolio anytime. It is available at your screen round the clock. You can invest quickly with your Aadhaar number which will be based on your registered eKYC. You can also refer to magazines which are distributed in the market monthly or weekly. There is a magazine called “Mutual Fund Insight”. You can read the series of this magazine and learn the insight details of mutual funds. This article is containing the best app to buy mutual funds with their respective links to download. The download links are only meant for the Android phones, so every Android user can enjoy these mutual fund investment apps on their screens. You can gain the information regarding the best app to buy mutual funds at the same links. The same information is provided to you here in this article also for your convenience. Dear readers! I hope you had a great time reading the above content on Best mutual funds app. I hope you are satisfied with the above-mentioned information pertaining to the best app to track mutual funds India. If you want something more or you have any suggestions for us then you are most welcome. Your queries are always read and answered by us in the comment section below. If you like reading us then just let us know and subscribe us. We will be back with another useful article. Till then, do conversation with us using the comment box given below. Please like and subscribe to us! Next articleBest Share Trading Apps in India for 2019:- Online Mobile Trading Android Apps?